Other programs open them without problem though. 2. IG assigns some strange color profile to images named c2. There is very little info on the web about this, almost none. Some say it is the same as sRGB but I haven't tried to investigate further. In any case - it doesn't sound standard and I don't know why FB decided that they should invent something in colorimetry. a) Convert the image to sRGB inside Photoshop using Edit->Convert to profile. It should work the same if you do it using Save for web but the fact is - IG shows different result. 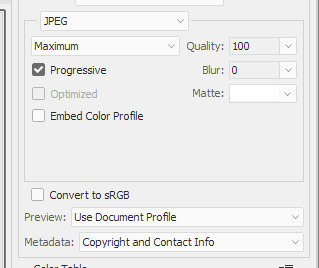 The key point is: leave "Embed Color Profile" and "Convert to sRGB" unchecked. What is interesting is that FB also assigns the c2 profile to images but it processes correctly also with embedded color profile and/or with "Convert to sRGB" checked. Yeah, I've noticed that with IG. If you have a wide gamut monitor, the colors are so freakin' over saturated. They are the only site that does this that I know. FB, Twitter, MM, Flickr, 500px, etc don't have this noticeable issue. I use Chrome and can't find a setting to force it to show correctly. Firefox does, but, it's not my browser of choice. It is not a matter of gamut but of wrong color management. MM preserves the original image as long as it is within 800x4000px as you can see on the image upload page. So as per standard browsers should render the colors considering the color profile and it seems they do. However FB and IG manipulate the color profile and it seems for IG there is some abnormal color processing before assigning that strange 'c2' profile and that affects the final result. And of course they also compress quite a lot the images, so they can load faster on mobile devices. I haven't made any tests with Flickr, Twitter and 500px. There is a setting for Chromium '--enable-color-correct-rendering' which enforces images without color profile to render as sRGB. However it doesn't work as expected on Linux. I have filed a bug report some time ago, so developers know about it. Yet another anomaly to keep in my head when processing pictures for social media! Thank you for bringing this to light. Today I tried uploading a photo following the procedure which is explained in the OP. However it turned oversaturated, i.e. wrong color management again. Uploaded the same image through another account for a test - it looked fine. Then tried again in the first account - oversaturated. So not only there is a problem in IG, but it is also inconsistent. Dumb question (just trying to eliminate possibilities). Were both IG account tests that you uploaded from, done on the same computer (or device) and the same browser / app? Yes. Same browser, same computer. It seems that Jpegs from Instagram have some other Photoshop data left in them and I guess photoshop can't figure it out and gives an error. Other soft doesn't care since that's photoshop specific data. You can delete it using XnView or any other similar software. And after that all is good. But of course that's just one problem. I noticed the colour saturation increase when I started using Instagram too but thought it might be the nature of the phone I was using (there was no Windows app for Instagram at that time and as far as I know you still can't upload images to Instagram from a PC... not sure about a MAC). I export JPEGs from Lightroom, upload them to OneDrive (OneDrive doesn't change them as far as I know but I could be wrong), import them to my phone (I like to keep full size copies on my phone in case I'm in an area with poor cell reception), and then upload them to Instagram. I got used to reducing the 'saturation' and 'vibrance' settings by 10% before exporting. I then fiddle with the 'edit' settings (usually by no more than 10% either way) in Instagram before posting. I realize that this isn't the ideal way to handle my images (and I don't think of myself a professional photographer, retoucher, colour monkey, bricklayer, carpenter, plumber, doctor, boyfriend, etc.) but I have always considered the internet a poor place to show off the quality of anyone's work because I can't control how anyone else sets up their monitor (or viewing device) or which OS, software, or hardware they use to connect to the internet with. A few years ago I started shooting real estate and if you want to talk about poor image handling... that's a great place to start. it doesn't matter what size image you upload to the MLS site, it gets re-compressed to death and it looks like crap when it's done. I used to work for a company that built on-line stores for businesses and there was image compression built into the application. Any image that was uploaded to the site was compressed and resized. I'm guessing that whoever wrote the script had no interest in image quality because at that time, bandwidth and storage space cost a lot. This is just another guess but it's likely that a lot of social media sites (and sites like Kijiji, ebay, MLS) use something that's based on that old script. ...again - not a pro - just my 2 cents. And I just checked and I don't get the parsing error you get in Photoshop (latest CC edition). The colours are a touch different (because I edited them in Instagram) but the file opens normally. Instagram is not the problem. Every web browser has got his own color algorithm. Compare Chrome and Safari for example the color shifting is immense. The software, in this case (the browser software) is the problem. I doubt if changing a color profile will fix the problem. Tbh I don't think there actually is a fix for it. Even If you are able to get the colors right on other peoples monitors the colors will also shift and show of differently. This is one of the core problems along imaging. You are mixing 3 different things. 1. IG *is* the problem, otherwise I wouldn't open this thread. It changes the image colors. You can download the image from IG and compare it to the source in Photoshop and you will see it is different which is totally browser unrelated. 2. Some color discrepancies in certain browser versions do exist but that is a separate issue. Of course there is a fix for this - the software developers must be informed (through bug reports) so they can work on it. In any case if you open the local version of your image and the one uploaded on IG in the same browser it is not an issue of 2 browsers. 3. Similarly monitors have nothing to do with all that as the comparison is made on the same monitor. Software developers are not into imagery. Imaging and developing are two separate jobs that are complete different from each other. They write a certain code, that's all. God knows what the algorithm is based on. That's why a image conversion is different in every raw converter. Ok, maybe Instagram is shifting colors. The problem will remain as you will not fix the real issue just by changing a bunch of file settings in PS. As someone who writes lines of code almost every day (although not a developer per se) I can assure you that there is no such thing as "write certain code, that's all". Programming is not some kind of isolated work in which one types some out of context commands and magically they output an image. But all that is off-topic. Ok, maybe Instagram is shifting colors. The problem will remain as you will not fix the real issue just by changing a bunch of file settings in a photoshop. I just shared something which I found the hard way + a solution which worked for me. It is not compulsory to use the information, so feel free to ignore it if you consider it not helpful. It seems Instagram has fixed the issue. Now uploading an image with embedded sRGB doesn't change color.